Paint Colors. We don’t even know where to start because well… it’s pretty freakin’ complicated! 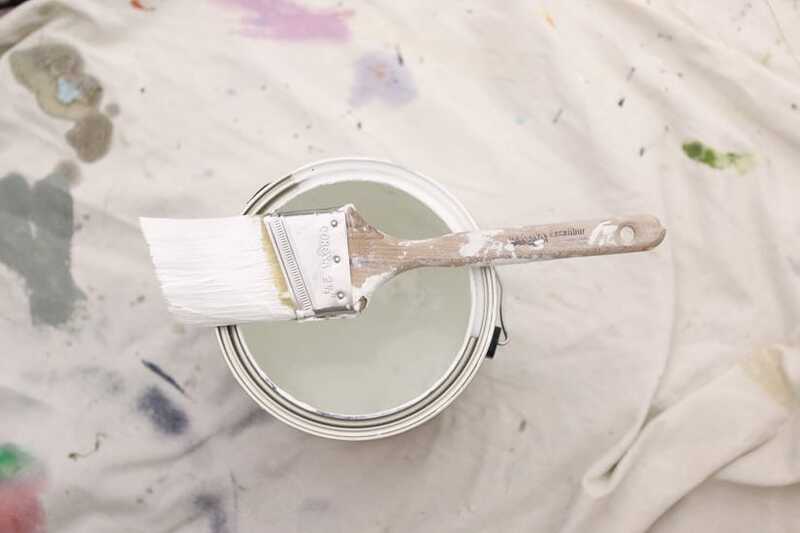 The perfect paint color can make such a difference in any space, but getting that “perfect” home paint color can be a complete nightmare. Like having a million different swatches to choose from?! 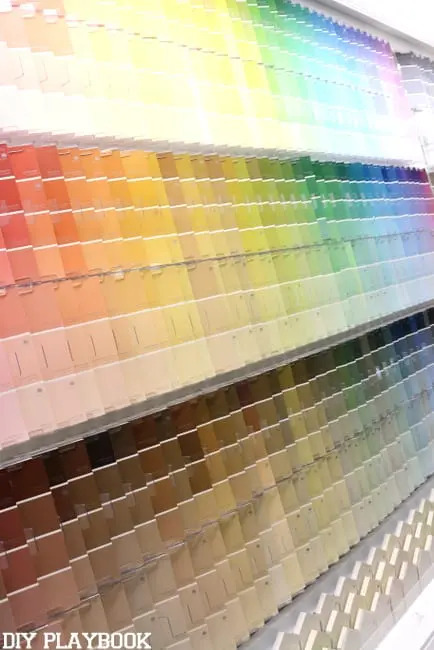 Or finally picking a color only to paint it on the wall and realize it’s not what the swatch looked like?! 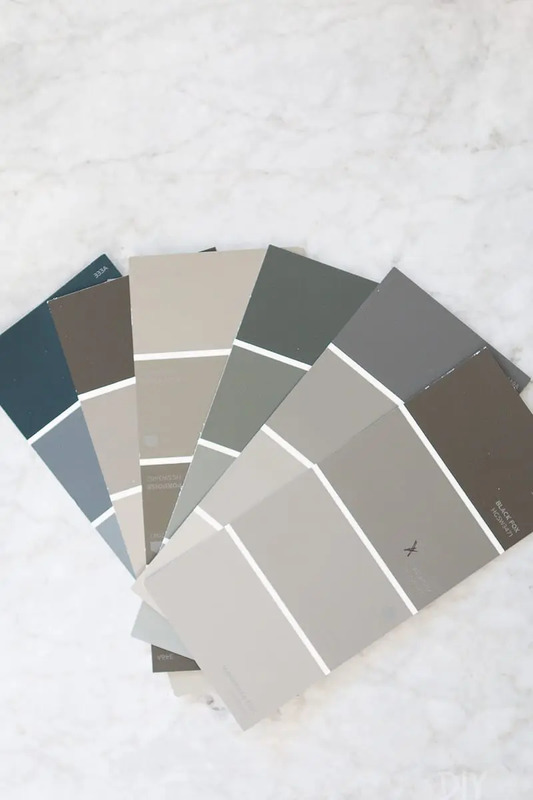 We definitely can’t promise that these colors are right for your space, but the following neutral paint colors are the ones we currently have (and love!) in our homes. As we said, the process of choosing these colors was an overwhelming nightmare and probably requires 10 more posts. So instead of getting into those boring details, we’re going to jump right to the good stuff. Without further ado, here are ALL of the neutral paint colors we both currently have in our homes. Bridget: First up is the only bold color of the bunch. I used Benjamin Moore’s “Covington Blue” (eggshell finish) to paint both the exterior and interior of our front door and this still is hands-down one of my favorite projects to date. Bridget: Our “great room” is Benjamin Moore’s “Revere Pewter.” I really love the look of this warm gray and I am always surprised at all of the different shades this color takes on throughout the day. Depending on the amount of light/sunlight in the house, the walls take on a slightly different color. For more tips on how and where to paint these, check out this post. Casey: A majority of our Chicago apartment is painted in the color “Passive” by Sherwin Williams. 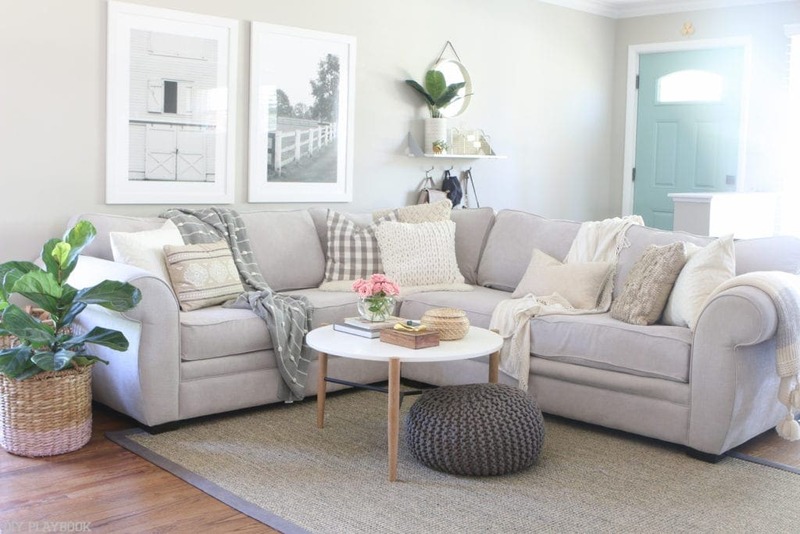 When choosing a color, I wanted a very light gray with cool undertones. That is exactly what I got with this color. 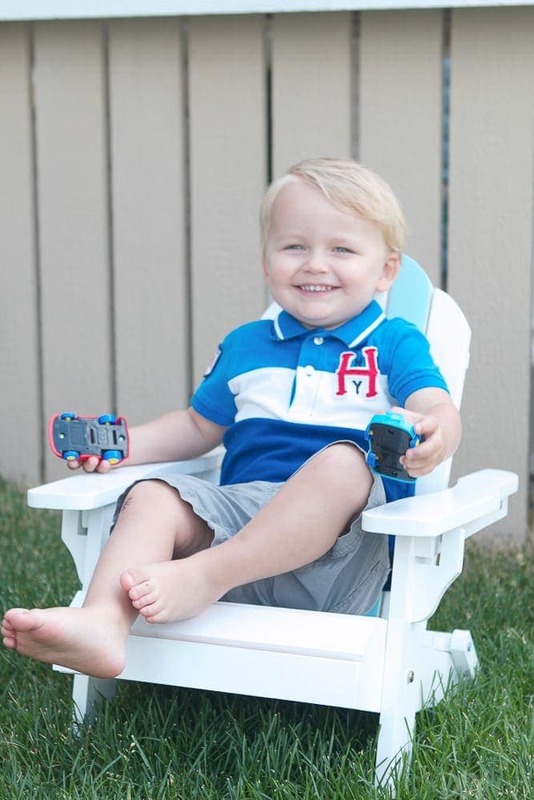 It pairs nicely with our white trim and the cool color palette in our home. At times it looks a bit icy blue, and at other times it’s really light gray. Overall though…we really like it and I’ve recommended it to plenty of people. 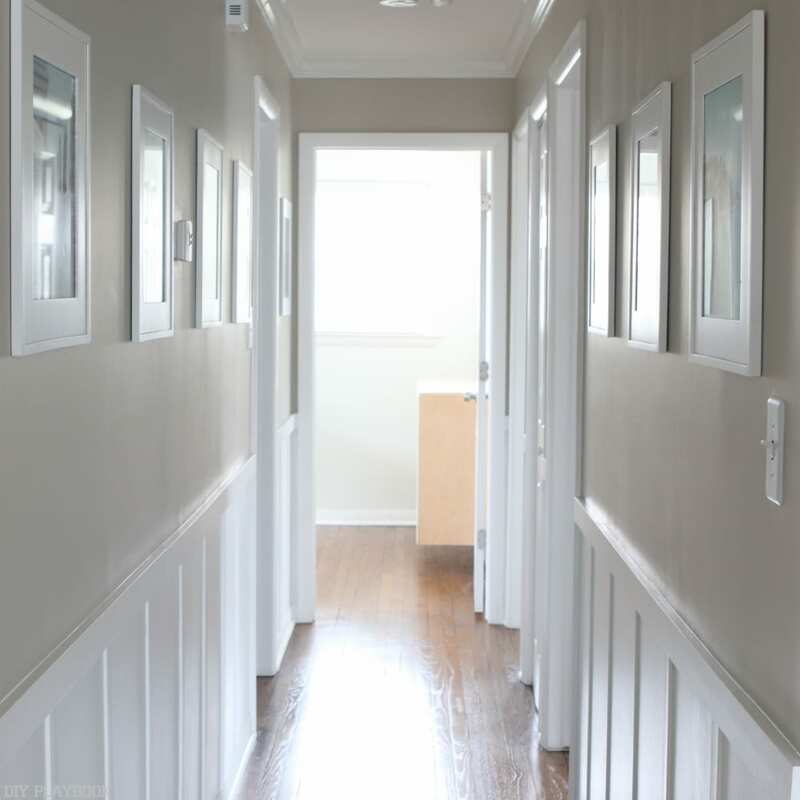 Bridget: In our hallway with our board and batten, you’ll find Revere Pewter again paired with the white on the bottom. Love this neutral walkway. Bridget: Our guest room and office are both Benjamin Moore’s “Moonshine.” This gray takes on a slightly blue undertone at times throughout the day. The color is extremely mute, which I love because it complements almost any colored decor/accents. Casey: This is by far my favorite color in our home. It’s right next to “Passive” on the color swatch, and it’s a slightly darker version of it. Our master bedroom is painted in “Argos” and I think it’s fantastic. Not too dark, not too light. A great light/medium gray choice. Looks amazing with white accessories and white trim. 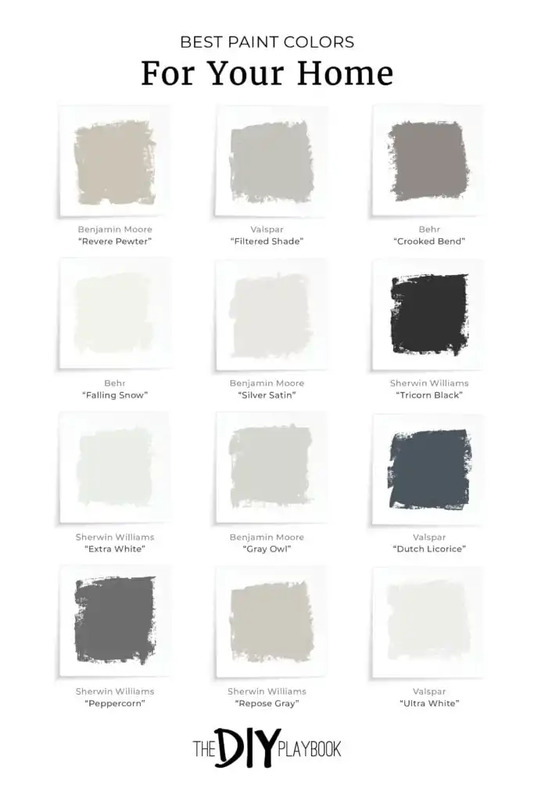 Bridget: Our bedroom is Benjamin Moore’s “Edgecomb Gray.” To me, the swatch above isn’t the perfect representation of the actual color (surprise, surprise). I would describe the look as a very light “sand-y” color. I have no clue why, the light beige just reminds me of that and the fact that it has gray in the name adds to this complicated status. 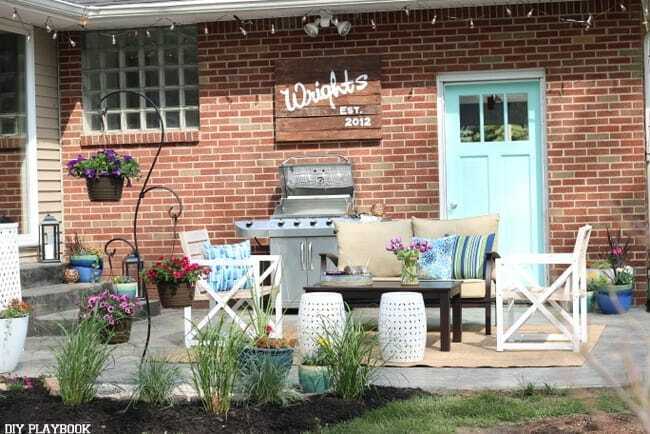 Patio Makeover: We tackled this patio makeover for a family in Buffalo, NY. 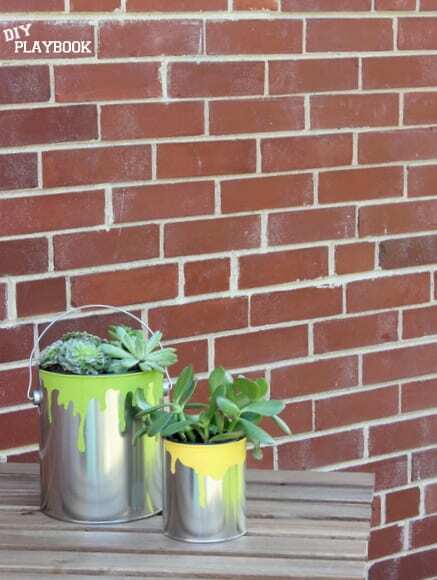 You can see the whole reveal here, but we absolutely LOVE this paint color for a pop of brightness outside on the patio. As we mentioned, we both really love our home’s neutral paint colors. We can’t promise we’ll be married to them forever, but for now, they’re just right!